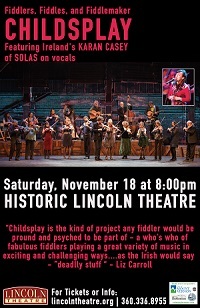 Childsplay’s over two dozen musicians come from all over the United States and Europe and include some of the leading virtuosos in traditional and contemporary fiddle music. For over 20 years, Childsplay has performed in the United States and Europe, showcasing different styles of fiddle music. From humble dance halls to feature performances at The Smithsonian Institute in Washington, D.C., before world music audiences in Sweden and public radio audiences throughout the United States, Childsplay has introduced many thousands to the delights of traditional Irish, French-Canadian, Cape Breton, Bluegrass, Appalachian, and Scandinavian fiddle music, as well as jazz, swing, and classical music. The level of musicianship in Childsplay is unsurpassed, with players ranging from members of the Boston Symphony to the leading virtuosos of these various fiddle traditions. Featured singer is Ireland's Karan Casey formally of Solas. $2 off for Lincoln Theatre Members. Tickets go on sale to Lincoln Theatre Members on Friday, June 29th at 12:00pm. Tickets go on sale to the General Public on Friday, July 6th!